This is another variation of my not-lightweight micro quadcopter frames for the hubsan x4 FC. 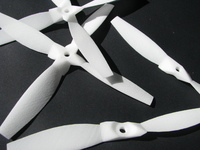 This version houses 8.5mm motors and flies extremely well. It's called racer because it seems to be more stable at higher speeds in forward flight. I recommend printing it in ABS.